Two months old? Isn’t that the same as newborn or at least, newly born? Well, yes, in terms of adjusting to another child in the household. 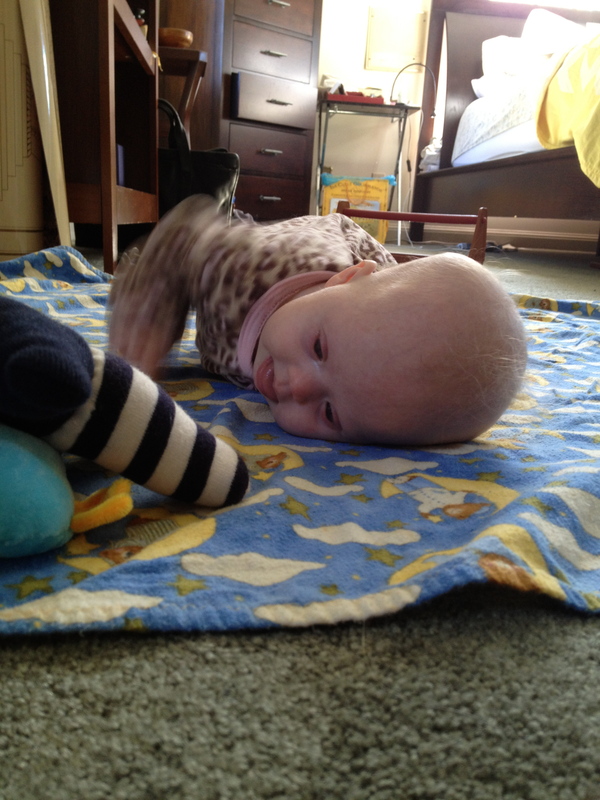 But in terms of brain development, two months old is, well, getting up there. Lyra was born on August 14 with many markers of Down syndrome (DS) and cataracts in both eyes. Because I am 46, I underwent many prenatal tests, except an amniocentesis, while expecting Lyra. The extensive blood work and high-level ultrasounds did not reveal any abnormalities and when I had a fetal echocardiogram, the cardiologist said everything looked beautiful and, “beautiful is better than good.” Having decided we would not terminate a pregnancy if the baby had DS, Max and I passed on an amnio. Superstitiously or intuitively, I was certain I would lose the baby if I had an amnio. My Grandma Dorothy, who was a mother to me, had four boys and I have four boys. Her only daughter, her second child, died at birth because of the Rh blood factor. Grandma had negative blood and her baby girl’s was positive. I too have negative blood and my daughter’s is positive, but since the 1970s there has been a remedy. After each of my babies’ births, I was given a RhoGam shot, which prevented my body from building antibodies to positive blood. Grandma kept trying for a daughter, even when my grandfather did not agree, but she only had boys. I, too, kept trying for daughter (albeit with full support from my partner), and when I learned my fifth child was female, I felt an amnio would cause me to lose my baby just as the Rh factor took Grandma’s daughter. It isn’t logical, I understand, but I felt emotionally very strong about this connection. I still do. Lyra was born on a Tuesday. On Wednesday, we were squeezed into an appointment at a pediatricians’ office affiliated with Akron Children’s Hospital (ACH). They referred us to ACH’s pediatric geneticist whom we saw on Thursday and before we left, a vial of Lyra’s blood was drawn for genetic testing. 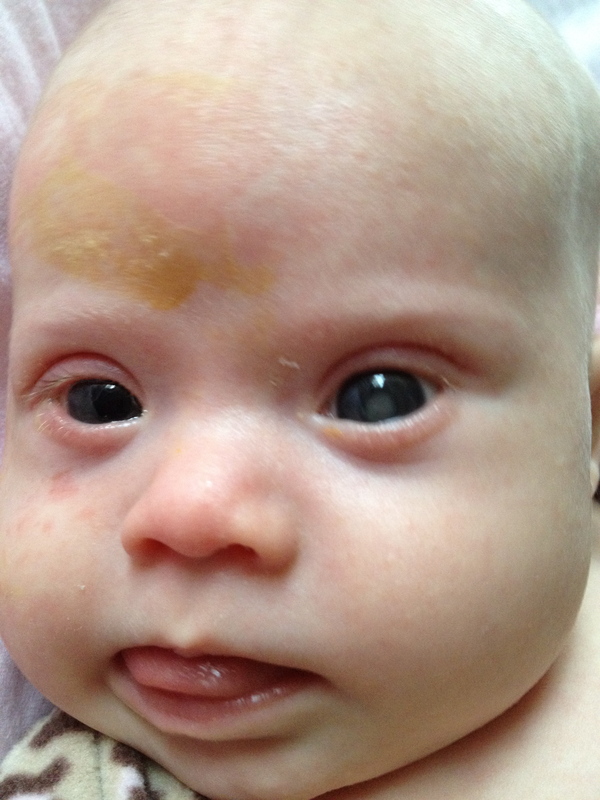 On Friday, the blood results confirmed Lyra’s Down syndrome. The following Monday we saw our first pediatric ophthalmologist, who sent us to a second surgeon, who immediately scheduled Lyra for surgeries at the tender ages of six weeks and seven weeks. Why so young? 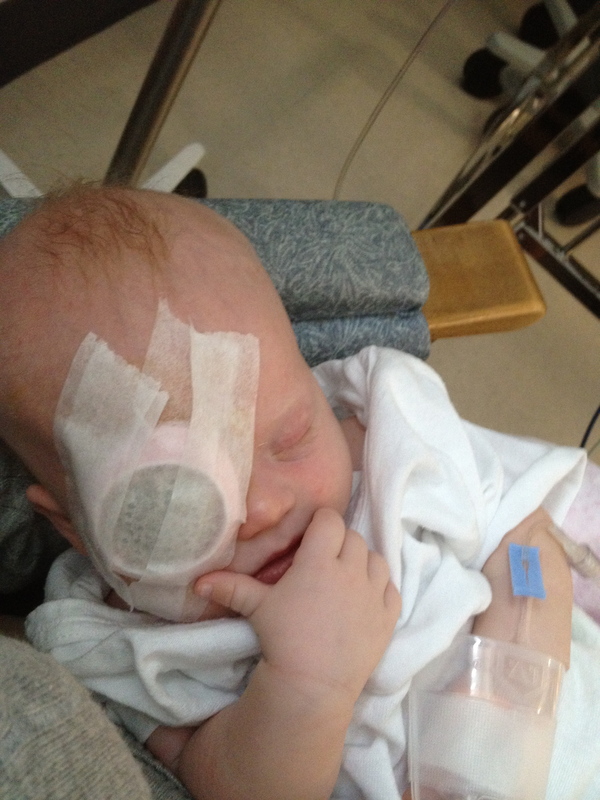 Because a newborn’s brain is bubbling with growth and without any visual input, Lyra’s brain would not have developed all the necessary components to process what it is to have sight. The same can be true of hearing and the other senses. Neurologist and author Oliver Saks has written accounts of adults regaining hearing only to be miserably confused and want to return to the deaf world their brains’ knew and understood. In the Val Kilmer film, At First Sight, a blind man has an operation to regain his vision. In a poignant scene, he cannot make sense of glass and ends up breaking a window. And that’s how Lyra came to have eye surgery at the tender age of six and seven weeks. Each eye had to be dilated for a week post-surgery to minimize scarring after which she began wearing contact lenses. She’s too young for surgical implants–her eyes are still rapidly growing. Her contact lenses are similar to mine and will be cleaned monthly and replaced every three months. The correction, however, is not at all similar—I don’t see very well without my glasses or contacts as my prescription is about a -4. Lyra’s prescription is a +20. Lyra after her right eye had the lensectomy. That eye is clear while the left has the visible cataract she was born with. Oddly, I did not think of Lyra as blind until the first cataract was removed. But she was. When she was a month old and coming out of the newborn sleepiness, we noticed her eyes were starting to wander around, each rambling about in its socket. Her brain was becoming the brain of a blind person. Only one in 10,000 kids with Down syndrome are born with cataracts, though most kids with cataracts have DS. Of all the possible and serious medical problems attendant to DS (heart problems of varying degrees of severity occur in forty to sixty percent of people with DS), we are grateful cataracts is all Lyra has to deal with. We felt that way immediately and said so to the ophthalomologist the first time we met him. Just as soon as he put her second contact in her left eye, her eyes began tracking in sync, her brain quickly discovering how to process all the visual stimulation she is now receiving. After receiving both contact lenses, Lyra gobbles up all the visual stimulation she can get. She has now been wearing both her lenses for one week and it is as if she has been awakened. She searches for our faces when she hears our voices, looks at our eyes and smiles. I loved my blind girl fiercely, but this smile of recognition by my now seeing daughter is incomparable to any other I’ve known. No lover has melted my heart with a single gaze the way this recently born peanut has. Many years ago, when my big boys were wee, I learned a children’s song in which the verse goes, “I see you and you see me, la-la-la-la-la-la-la.” When I sing it to Lyra, as I often do lately, it is not a sweet, meaningless ditty. It says everything about the first two months of our life with Lyra and hers with us. This entry was posted in Lyra's Latests, Uncategorized and tagged advanced maternal age, Akron Childrens Hospital, amniocentisis, Down syndrome, pediatric cataracts, rh blood factor. Bookmark the permalink. immer sehr beliebt sind, gibt es die Tasche heute als Tutorial. OMG I love this. The smile of recognition is the best. Send this to The Sun Magazine Holly!